Evidence emerged last week in a report by Mother Jones that Romney had maintained an ongoing leadership role at Bain beyond February 1999. Citing SEC documents, the magazine said Romney had control of Bain Capitals shares in Stericycle, a medical waste company, in November 1999. Talking Points Memo reported this week on additional SEC filings listing Romneys position with Bain in July 2000 and February 2001. A former SEC commissioner told the Globe that the SEC documents listing Romney as Bain’s chief executive between 1999 and 2002 cannot be dismissed so easily. “You can’t say statements filed with the SEC are meaningless. This is a fact in an SEC filing,” said Roberta S. Karmel, now a professor at Brooklyn Law School. A spokesman for the SEC said the commission could not comment on individual company filings or address the meaning of Romney’s name and title on the documents. Karmel, the former SEC commissioner, said the contradictory statements could have legal implications in some instances. Romney first deployed the defense that he left the firm in February 1999 as a candidate for governor in 2002, when Democrat Shannon O’Brien featured a laid-off worker from a Kansas City steel mill that went bankrupt in 2001, after Bain Capital had reaped a handsome profit from its investment in the company. “Romney has taken responsibility for making the initial investment but has said he could not be blamed for management decisions at the company,” the Globe reported at the time. Romney’s exit from Bain Capital also served as a ready-made rebuttal when in May President Obama’s reelection campaign began its public scrutiny of Romney’s business record with an ad focusing on former laborers at the same mill, GST Steel. 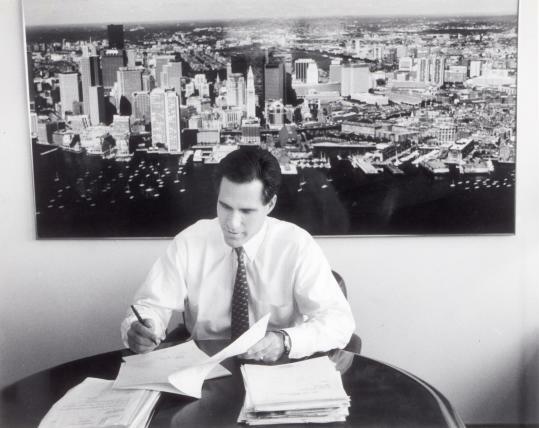 But the SEC filings examined by the Globe indicate Romney remained at the helm of Bain Capital when the steel mill declared bankruptcy, in February 2001. And financial disclosure documents Romney filed in Massachusetts show that he was paid as a Bain Capital executive while he directed the Olympics. When he was named chief executive of the Salt Lake Organizing Committee on Feb. 11, 1999, Romney declared that he would not accept the job’s $285,000 annual salary until the Games were over and he had proven his turnaround worth. Romney continued to draw a six-figure salary from Bain Capital, according to State Ethics Commission forms. In Romney’s 2002 race for governor, he testified before the state Ballot Law Commission that his separation from Bain in 1999 had been a “leave of absence” and not a final departure. Callum Borchers can be reached at callum.borchers@globe.com. Follow him on Twitter @callumborchers. Christopher Rowland can be reached at crowland@globe.com. Clarification: This story has been updated to note previous reporting by the publications Mother Jones and Talking Points Memo on Romneys involvement with Bain.